Griffin Systems develops high-quality map software for AndroidTM. Our map products overlay the best hiking and exploration topographic maps on top of an OpenStreetMap background, making the maps available as a mobile app with no reliance on cellular service. The result is a rich, reliable, geographically accurate experience. Our flagship product uses several Tom Harrison Maps topographical maps, available for purchase within the app. See our Tom Harrision Maps app in action! Tom Harrision Maps publishes the best full-color, shaded-relief topographic maps for hiking, backpacking, and mountain biking in Parks, Forests, and Wilderness Areas in California. We have worked out a licensing arrangement with Tom Harrison Maps to use their detailed and attractive print maps for our apps. Follow our Facebook page to see upcoming Griffin Systems map applications as they are released! Tom Harrison Maps: v1.0 released! New maps! Death Valley and Lake Tahoe now available. Mammoth High Country and San Gorgonio apps rolled into all-in-one app. 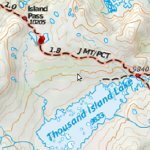 Tom Harrison Maps: San Gorgonio Wilderness v1.0 released! Tom Harrison Maps: Mammoth High Country v1.0 released!